An aristocrat who wrote an online post offering £5,000 to anyone who ran over businesswoman Gina Miller has been found guilty of two charges of making menacing communications. Rhodri Colwyn Philipps, 50 - the 4th Viscount St Davids - wrote the message four days after Ms Miller won a Brexit legal challenge against the government. Chief magistrate Emma Arbuthnot said she had "no doubt it was menacing". 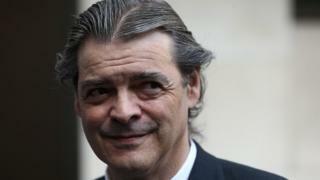 Philipps, who called his comments "satire", faces a custodial sentence. He was found guilty of two counts of making malicious communications and acquitted of a third at Westminster Magistrates' Court. One of the counts related to a post regarding Ms Miller, published on Facebook on 7 November 2016, which said: "£5,000 for the first person to 'accidentally' run over this bloody troublesome first generation immigrant." Philipps, of Knightsbridge, London, described her as a "boat jumper" and added: "If this is what we should expect from immigrants, send them back to their stinking jungles." Ms Arbuthnot found this offence was racially aggravated. The court heard how Ms Miller, 52, said she felt "violated" by Philipps's "shocking" comments about her. Ms Miller led a successful legal challenge which, on 3 November, resulted in the government being told to consult Parliament before formally beginning the Brexit process. Philipps, who defended himself throughout the trial, said his posts had been simply reflecting how he and others felt following this ruling in the High Court. He told the court: "My family motto is 'Love of Country is my motivation'." He said his comments were "meant to be a form of satire, a literary technique, iterated in my personal style, which may not be to everyone's taste, but is understood and accepted by everyone who knows me". Ms Arbuthnot, in a series of exchanges with the peer, asked Philipps: "Boat jumper, how can I see that as anything other than a racial, ethnic aggravation?" But Philipps denied the allegation that his posts were "racially aggravated" saying that describing Ms Miller as a "boat jumper" and that she should go back to the "steaming jungle" were "statements of fact not a racist comment at all". He added that he would not have made any serious threat "on an account where I could easily be identified". He added he had deleted the posts as soon as he realised that his closed circle of Facebook friends had been "infiltrated" and screen shots of the posts had been passed to Ms Miller. Delivering her verdict, Ms Arbuthnot said there was "nothing private about a Facebook post". The other post Philipps was convicted for was in response to a news article about an immigrant in Luton, who was involved in a row over housing. Philipps wrote: "I will open the bidding. £2,000 in cash for the first person to carve Arnold Sube into pieces." Kate Mulholland, from the Crown Prosecution Service said: "No-one should have these kind of menacing comments made to them or about them." Philipps will be sentenced later this week.